Will be sadly missed by his family: his wife Merilyn (Sunstrum), son Aaron of Vancouver (grandchildren Hudson and Anna), daughter Rachel of Oakville, mother Mary De Lazzer, brothers Frank and Bill, sister Gloria. Predeceased by his father Abramo and brother Larry. Visitation Tuesday, June 29, 6-8 p.m. Funeral Wednesday, 1 p.m. All at GLEN OAKS MEMORIAL GARDENS, 3164 Ninth Line, Oakville, ON. 905-257-8822. 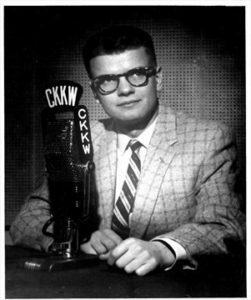 John De Lazzer got his first big break as morning host at Kitchener’s CKKW in the 1960s. Merilyn Sunstrum first spotted John De Lazzer in high school. By Grade 12 the couple was dating and John had become the school’s DJ, while also working at a local radio station. John was born in Nova Scotia, one of five siblings of Italian immigrants. At age five, his family moved to Niagara Falls where as a youngster, John found summer jobs picking fruit then later as a delivery driver. His father, a skilled cabinet maker and carpenter, worked hard to support his large family and John always felt the need to pay his own way, said daughter Rachel De Lazzer. “He was frugal,” she admitted. After high school, Merilyn went to teachers college while John launched his broadcasting career, starting at the Niagara Falls station, moving to a larger local station and finally he got a break: CKKW in Kitchener. “His real start in the business was probably here in Kitchener,” said Don Wilcox, a retired broadcasting executive and John’s former boss. The Kitchener station first hit the airwaves in 1959 and when the morning host position became available a couple of years later, John applied. Don said he knew right away they had the right guy. In 1962 John and Merilyn married and she found a job teaching kindergarten in Kitchener. The following year, John moved to the afternoon host position after the station changed ownership and moved to what is now the CTV building, on King Street where they ran both the radio and television station. In 1970 John found an exciting new opportunity. The educational network TV Ontario launched that year and John was offered a position. The couple moved to Toronto but after a few years, they moved to Oakville where they have lived for more than 30 years, John making the daily commute to the city until his retirement in 2005. Merilyn said her husband loved his job at TVO and was fascinated with the people he worked with, their personalities, their quirks, though never in a judgmental way. He was simply interested in people, appreciated everyone. Though he had been an on-air personality for years, John was not outwardly social, more of a homebody really, yet somehow, when he walked through the doors at the television station every day, he would turn on his considerable charm, smiling and engaging with everyone. Rachel said her dad, an avid reader of newspapers, books and magazines, was knowledgeable about myriad subjects and became animated when in discussion, as long as the discussion didn’t turn to him personally, probing his feelings or thoughts. Then he would simply clam up. 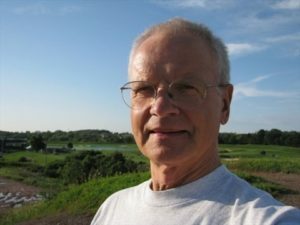 For 35 years John was a solid presence at TVO, as a producer and director as well as doing voice-overs, promotions for shows such as Polka Dot Door and Today’s Special and co-hosting a youth program called COPE, which still exists on video in school libraries. John was also fit, a regular runner and anyone who every wandered down Yonge Street during the three decades he worked downtown, was sure to see him galloping along the sidewalks during his lunch hour. But at home, his place of refuge, John was quiet, preferring to putter around the kitchen experimenting with richly flavoured foods, though he ate very little, preferring just to taste his creations. He had little interest in travel or socializing though he loved grocery stores, loved chatting with the clerks and always came out with several bags and a huge grin. Merilyn said her husband was highly organized and a creature of habit, yet he also had eclectic tastes in both food and music. Rachel said her father spent a lot of his retirement time trying to help her, whether it was ensuring her water cooler was full or ordering a car charger after her cellphone died at work a few times. That particular gift unexpectedly arrived by mail shortly after his death. As a child she recalls his nurturing both her and her brother Aaron, and his special talent for animated story telling. “He was the best reader; great voice, perfect intonation and he spoke flawlessly,” she said.